It is a fact, known and recognized world over that mothers are superheroes of their own kind. Our first role model, our first view of womanhood, our first source of bridal inspiration, (our saree stealing source too) – we could go on and on! While she spends hours and sleepless nights putting together outfits for your sangeet, mehndi, cocktail, haldi and reception – calls hotels to make arrangements and makes sure that all the guests don’t miss out on that welcome basket, make sure she doesn’t forget herself in the hurry-blurry of planning your wedding. Which is why we’ve put together brilliant looks handpicked from our Real Weddings for some serious Mother of the bride/groom inspiration – because mommies, it’s your day too! Whether for an outdoor welcome party or an intimate indoor reception – scroll down to see more! This mother-of-the-bride and A-list bag designer Meera Mahadevia looked like royalty in her gorgeous sheer and silk saree with the pallu made in hues of beige and gold while the pleats had intricate gold weaves on a red base. More from this Real Wedding here. This gorgeous mother of the groom did it so right with picking a pretty pastel peach and pairing it with a bold polki and emerald green gemstone embedded necklace set. While it’s still kind of hard to believe this stunning woman is the mother-of-the-bride her gold pankh necklace set paired with a red and white lehenga are giving us some serious inspiration. Our Real bride, Hetali’s beautiful mother dressed in a mix-matched lehenga set in hues of royal blue, peach and green – so unusual yet so elegant! Simply draped red and white gota patti saree along with a matching bandhini dupatta. Paired with bold pearls and polkis – this mother-of-the-bride was a personification of understated beauty and grace. Lost in happiness, this mother-of-the-groom sure looks like perfection dressed in a fully embroidered lime green and pink saree with gorgeous diamond and emerald jewellery. 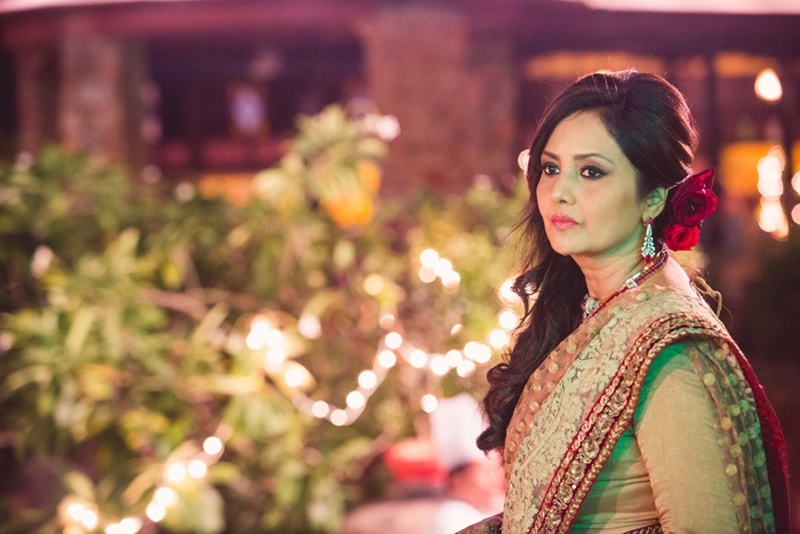 This stunning mother-of-the-bride played it classic with her tastefully embroidered lehenga choli with beautifully layered diamond jewellery which included a necklace, earrings and a delicate maangtikka. Chikankari anarkali? Definite yes! This ravishing mother of the bride stuns in a chrome yellow chikankari anarkali featuring intricate paisley details that left us mesmerized. Mother of the bride goals right here! A ravishing mother of the bride who stood out in a crowd dressed in a gorgeously weaved gold and maroon kanjeevaram silk saree with layered gold jewellery and a delicate, dainty maangtikka.